Beat sugar, syrup, salt, flour and eggs together. Add vanilla, butter and pecans. Pour into shell and turn up the rounded side of some of the pecans. Bake in preheated 300° oven for 1 hour or until set. Cool before cutting. Serve with whipped cream or ice cream. 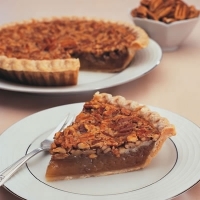 To make chocolate pecan pie, combine 2 squares melted unsweetened chocolate with butter.